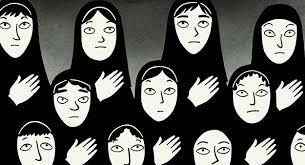 Persepolis tells the story of a girl who grew up in Iran during the revolution and war, was sent to Austria to finish her education and then returned to Iran. Animation allows the filmmaker to tell difficult stories, the stories of torture and death, in a way that is somewhat gentle yet still packs a real punch. By telling of the revolution and war through the eyes of a child, some of the flaws are clear, and it does leave the audience aware that this is not totally factual, but the interpretation of a reality. Having said that, it is some of the very small moments within the film that give an extremely strong sense of place, particularly in Iran. Even just the ‘fix your headscarf, sister’ spoken by several men in the film shows the place of men and women in the society and their interactions. I didn’t like the end, though, because it felt that there was more story to be told. Yes, she is no longer in Iraq. She is conflicted in her emotions about this. But what happens to her? Where does her life go? What really happens from here? I just want more. Persepolis was nominated for an Oscar for Best Animated Feature Film.